We’ve got wildlife in the UK, though it’s more at the deer-and-badger end of the spectrum than lions and tigers and bears (oh my). I’ve seen the wild cattle of Chillingham, and puffins on the cliffs at Bempton, and gazed from Scottish highland crags and Norfolk beaches over basking seals at sunset. Each in its way is glorious – a reminder that even in little old Britain, it’s just a matter of striking off into the wild to see something extraordinary from the natural world. Just a couple of hours’ drive in any direction and I could see golden eagles, porpoises, otters and roe deer – never mind a stack of birds, insects and wildlfowers whose names I’ll never even know. But the single most thrilling thing I’ve ever seen happened right outside my window last week. 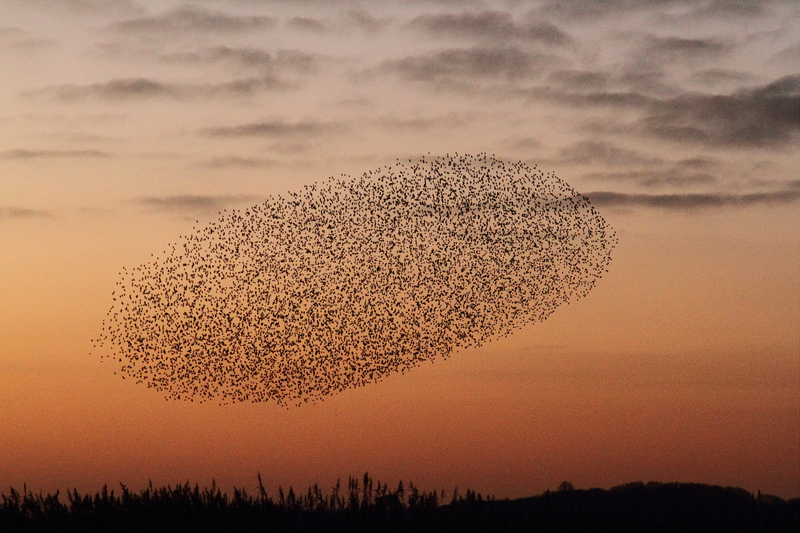 A murmuration of starlings – and ain’t that just the best word you’ve heard all year? – danced and swooped above my garden in a gorgeous synchronicity. All I did was point the camera. The starlings did the rest.